Ivan Ramen - the sign says it all, really. I can honestly say that before coming to Japan I had no idea that ramen was anything other than freeze dried noodles that came with a spice packet. I ate it occasionally in college, and that was about it. It left no lasting impression, except I did manage to ruin a hot pot making it in my dorm room. At least the fire alarm didn't go off. We did that once. Don't ask. 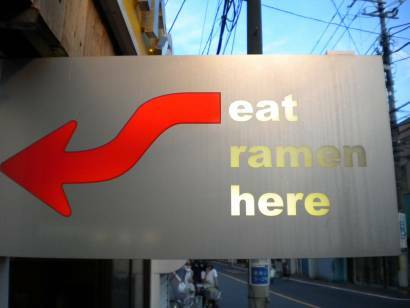 Since arriving here a little less than four years ago now, I've become something of a regular ramen eater. I'm no expert, but I've learned a thing or two as my husband has become a fairly major fan of the stuff. Mostly, I know what I like and what I don't like, and I'm getting a feel for what works and what doesn't. Ivan Orkin of Ivan Ramen has most likely forgotten more than most of us will ever know about this particular Japanese dish. My husband and I made a first journey to his shop during our early days here via a New York Times article on the best ramen in Tokyo. We liked the novelty of a foreigner making this dish, but Orkin's flavors and perfect noodles kept us coming back again and again. I can't even begin to express how awesome his soy milk tsukemen is...except perhaps in another review I write for JapanTourist! Meanwhile, you can read a review I wrote about a recent visit, and then wander over to try a bowl for yourself. Be warned: you might just get addicted.